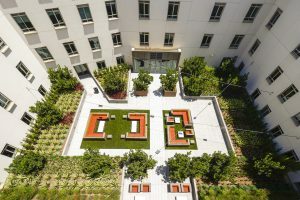 In August 2017, the University of Southern California (USC; Los Angeles) cut the ribbon on USC Village, considered the largest development in the history of the university. The 6-ha (15-ac), $700 million community hub is located at the northern edge of the university’s main campus. It features two grocery stores, 25 restaurants and retailers, a new dining hall, and eight new residential buildings. But 46 m (150 ft) below USC Village’s surface lies another campus game-changer: an on-site system that captures and purifies up to 95% of USC’s rainfall. The system, having successfully weathered its first California rainy season, will help Los Angeles water managers keep their groundwater aquifers filled as the region rebounds from a historic 5-year drought. 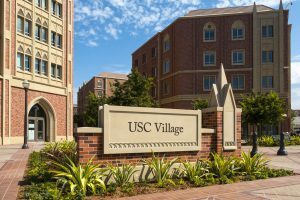 University of Southern California (USC; Los Angeles) Village, a new, 6-ha (15-ac) expansion to the main USC campus, opened in August 2017. Beneath restaurants, retailers, and residence halls, USC Village features a state-of-the-art stormwater capture system that will help Southern California replenish its drought-stressed aquifers. University of Southern California. More than 50 strategically placed area drains throughout USC Village can bring up to 371,000 L (98,000 gal) of rainwater into the underground system. Just under the surface, collected stormwater percolates through a series of six drywells. These penetrable chambers measure up to 18-m-deep (60-ft-deep) and eventually feed into the groundwater aquifer below. On its way through the drywells, the stormwater passes through a 12-m-deep (40-ft-deep) section of rocks and sediment, which naturally filter out debris and contaminants. Facilities staff will clean out this passive system thoroughly twice each year, planners told USC News. Then, below each drywell, the now-filtered stormwater must pass through at least an additional 3 m (10 ft) of alluvium before reaching the aquifer. By the time university construction crews first broke ground on the USC Village project, architects already were focused on sound stormwater management. The system was one of the first parts of the development to be completed. It was made a priority after the National Oceanic and Atmospheric Administration (NOAA) predicted that the 2015-2016 El Niño would be one of the most intense annual climate shifts ever to hit Southern California. While that year’s downpours failed to meet NOAA’s predictions, finishing the stormwater system early meant the rest of the development stayed dry enough to keep construction on schedule. From the surface of USC Village, the underground stormwater system is invisible. A series of 50 area drains spread throughout the development send runoff through gigantic dry wells, which filter contaminants from the rainwater before it reaches and replenishes the aquifer below. Gus Ruelas/University of Southern California. In post-drought Southern California, changing climate patterns and smaller winter snowpacks make it arguably more important than ever before to reuse water. State agencies implemented the California Green Building Standards Code in 2016, which requires new residential construction projects, among other sustainability provisions, to capture 85% of the stormwater that falls overhead. The USC Village stormwater capture project exceeds this requirement, thanks in no small part to the ground under which it was built, says Travis Longcore, a USC urban ecology professor. The project joins a growing number of other efforts in the area that work together to refill the region’s stressed aquifers. The Sanitation Districts of Los Angeles County (Whittier) operate 10 advanced water resource reclamation facilities in Southern California focused on indirect potable reuse through groundwater recharge. The facilities, capable of treating about 1,9 million m3/d (510 mgd) in total, help meet the water needs of more than 5 million Californians. Crops like grapes, which fuel California’s world-renowned wine industry, take up a huge amount of land area. For much of each year, swaths of land in the most fertile parts of the state lie fallow and unused. Now, some farmers are intentionally flooding their empty fields in winter to recharge groundwater aquifers in time for the growing season. Lance Cheung / U.S. Department of Agriculture. This winter, Helen Dahlke, a University of California, Davis hydrologist, is working with farmers to study the effects of field flooding on aquifers throughout the state, National Public Radio reported. 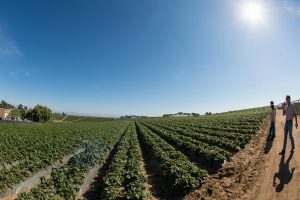 If the technique proves able to make a meaningful difference for groundwater recharge without affecting crop quality, widespread adoption could make a significant dent in the state’s overall water usage. Longcore says he hopes the USC Village stormwater project inspires Los Angeles and other cities to invest in water reuse. “Saving stormwater is one step toward retrofitting an urbanized watershed, and it’s a good example of how we should be retrofitting to capture and clean water. Every step like this takes us closer to restoration of our groundwater supply,” he said. It would be useful to know how much this project cost, especially the $/gallon cost for the water produced for infiltration. Is this type of project generally feasible for municipalities or businesses? My guess is no. Wonderful story to conserve water. This will be referred to with Hyperlink in March-2018 issue of “Udyog Sanchetana” a monthly, FREE, 2-page, eNewsletter being published online since April 2014. It introduces industry and developments in technology and the target audience are Engineering students in India.